We admit MD is a sucker for a picture of a new MV Agusta with a fancy paint job. Fortunately, this bike is more than just a fancy paint job. MV Agusta this morning announced the Brutale Corsa, a 1078cc, 158 HP naked with special features that set it apart from the Brutale 1090RR. Although sharing engine specifications with the 1090RR, the new Corsa features unique “ultra-light” forged wheels, as well as a fully adjustable Öhlins front fork (the 1090RR has a Marzocchi front fork). The Corsa also has its own unique “billet steering head”. Several other parts are machined from solid billet as well, identified in the press release below. All the details are in the following press release. We have no information on U.S. price or availability at this point, but you already know it will be quite expensive, reflecting its exclusivity. The price in Euro is 20,990. Follow this link for details regarding the technical specifications for the new Brutale Corsa. Varese, 8 July 2013 – Adrenaline, power, performance: hand-built in small numbers, the exclusive Brutale Corsa pushes back the boundaries even further to venture into previously unexplored territory. With 158 HP of power and 100 Nm of torque, the Brutale Corsa is instantly recognizable at first sight for the outstanding quality of its components, extreme attention to detail and spectacular bespoke livery. The benefits of the ultra-light specific forged wheels and fully adjustable Öhlins front fork in terms of riding dynamics are instantly perceptible, as are those of the billet steering head created specifically for this unique version. There are plenty of new styling touches too: from the frame finished in gloss black paint and the hand-stitched rider and passenger saddles to brake levers, rider foot pegs and brake and clutch fluid reservoir caps machined from solid billet. 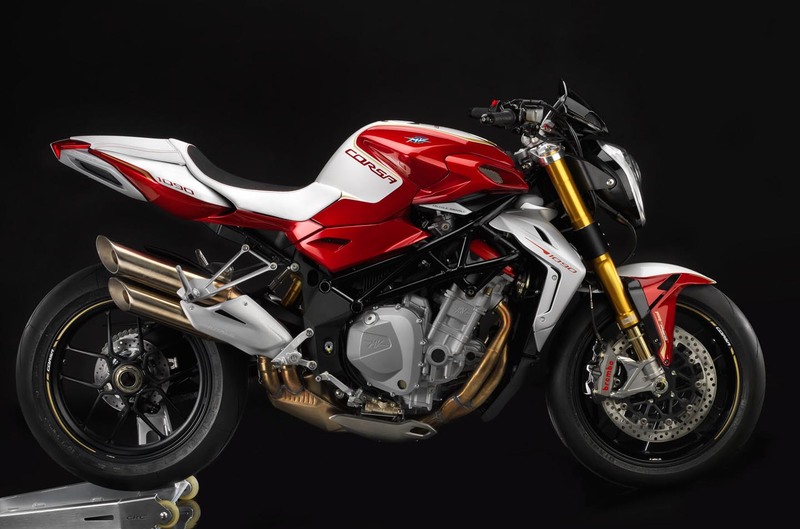 The tank guard has been created specifically for this bike, while the sports license plate mount and the carbon fiber rear mudguard and front mudguard spoiler are branded with the MV Agusta Corse logo. it starts do look dated. Purchasers of this creature gonna be motivated more by “lust than trust” – and dayam we ALL know how satisfying that is at times …. I just look at the picture and I get a blood clot behind my knee. For that price and no Ohlins shock? The old 910s, which is still beautiful, rides like crap with the Sachs shock. Still the thing of a beauty though! Kinda purdy lookin pig yer got there Mr …. Once again, to me this is a bike with no real purpose; great if all you want to do is ride around a bit, but not worth much if you want to go places far enough that you’ll most surely encounter varying weather conditions and temperatures. I need storage capacity for changes of clothes, etc. As others have pointed out, this bike is too conspicuously pretty for any location that isn’t top 1% upscale. Once again, a touring utility rider criticizes a sportbike for not being utilitarian. Same thing as a sport bike enthusiast commenting that the new Super Tenere is incapable of matching the Panigale’s lap time at a track, a metric that’s completely irrelevant to the bike’s intended customer. Conspicuously pretty and exclusive is this bike’s purpose. Nothing some cutting, welding and a big hammer couldn’t fix. Other than for the high price of admission and the perception of fragility there is no reason that this bike can’t be used for more than just “riding around a bit.” Slap on some soft luggage and with that comfortable upright seating position I would have no qualms with taking her on 500-mile rides and/or multi-day trips. I rode up to and across Canada and back on a naked SV650 with my wife riding pillion, and this MV Agusta would appear to offer a similar level of all-day comfort. Regardless of its beauty, it’s still just a motorcycle. As long as it holds up, it can be used in all the usual ways. Yes, yes, yes. Sure you *can* tour on just about anything, I suppose, but when there are bikes specifically designed for touring– or even carrying something home from the store– why would anyone pull out their checkbook for this bike when it is intended for a mainly purposeless purpose? This is just MY OPINION, but I wouldn’t even buy a bike of this sort simply because it’d clutter up my already over filled garage. As for slapping on soft luggage, I think most owners of this bike would cringe at the possibility of scuffing the paint. I wish MV and other manufacturers of purposeless motorcycles well, but I’m not interested. So go the full sacrilege route and throw some Ventura hard-mounted soft luggage on the thing! You never even touch the paint! When I was younger, I had the arrogance, the gall, to ride around in public on a bike like this (I actually did). But now, riding certain European bikes makes me feel the same way as I would if I was walking around in public in a speedo (we all know the Europeans don’t feel silly doing it). When I was younger, I had the bravado, along with the lack of modesty, to think I was a bad, bad man on one of those things and everybody who saw me on it agreed. Now as a middle aged man with a slightly receding hairline, I think I would look silly on one. Just as certain women are out of my league – okay, I willingly admit this – this bike is also just way out of my league. This damn bike is just too damn good looking for me. Suzuki needs to send their design team to Italy for a year so some of Agusta’s talent will rub off on them. Absolutely beautiful bike. I just wish MV would use a little less expensive parts and have a decent dealer network to support an affordable bike for us less healed. MV Agusta always makes it seem so easy, so why can’t the combined engineering might of Japan, Inc, give us exhaust systems that look even half that good? Never the mind the absence of a silly beak or any other gawdawful visual clutter. When it comes to styling the Italians are way out in front. Voxan’s are French bikes. Don’t know if they are still in business, but I really like the way they looked. I’d take them over the Italians. Styling a bike is easy, even a bike styled like this one. A fifth grader with a bit of artistic talent could do the same with adequate support and resources. If Japan is producing ugly bikes, rest assured, they are doing so only cause that’s what they are wanting to do, as incredulous as it may sound. Imagine if Japan actually started to style their bikes with some competence and verve, styled their bikes as if they too had eyeballs, what then would happen to the MV Agusta’s, Beemer’s, and all the other smaller, regional based bike manufacturers? Even Harley within a few years would be reduced to dust. Time to tell my wife to get a second job. Kitchen candy, get some garage candy. Congratulations to those of you who can afford on of these beauties. Wow, a little out of my price range, but for the few it’s a beauty.